Enter this giveaway for a chance to win a lucky dip box filled with wonderful bookish stocking stuffers and a very cute book mug made by Fable & Black. I would like to read the new novel about spooky puppets. That would make a fine gift. I love when I get books as gifts hopefully historical fiction. I love to get books and book gift cards for Christmas. And tea to drink while I read. im yet to read inferno so id love to get this for christmas! I prefer to buy my own books, so I can bargain shop, so I just ask for money. I think there's a big chance Santa will listen this year :). I want The Fireman by Joe Hill. I need a new book cabinet. Mostly I ask for Amazon gift cards to by books. I hope to get a new Kindle. I love book related jewelery, quilted book covers, book gift cards and books, especially Historical romance and historical fiction. My Christmas wish list includes books that round out some of my favorite series. Some I am missing a book, others I have mismatched (the horror) sets with ARCs and hard copies and I like them all the same! I also love bookish accessories and clothes and have scarves, socks, and tee shirts on the list! Great giveaway! Thank you! I have a few books on my wish list (actually there are probably 500 books on my amazon wish list) and there are some Etsy shops that I follow that have some jewelry that I want (mostly Harry Potter stuff). I have a few thriller books on my wish list. I also would love some bookish t-shirts or totes. The lucky dip is exciting. I haven't really celebrated Christmas since Dad died last year & Mum's just had a stroke so whatever we do it'll be low key. Just as long as she has a good time. I want the new Harry Potter book. It's a play script. I love horror and fantasy books and am perfectly happy and contest with ANY bookish items!! Usually romance for me! I'm not picky: urban fantasy, historical, paranormal, contemporary...as long as the plot is good, I'm usually happy! I don't have any preference on the gifts front. usually just giftcards so I can load my kindle :) thanks for sharing! I don't have any special books on my list. I like gift cards so I can browse the bookstore. I have Tales of Peculiar by Ransom Riggs on my list this year. Lucky for me, Barnes and Noble has a signed copy available on Black Friday! I'm always happy to have bookish items. This is a stunning giveaway thank you! I love all things bookish, but if I had to choose it would be one of the gorgeous bookish mystery boxes. I'd love a print set of the Daughters of His Kingdom series by Amber Lynn Perry! I love this giveaway 😊 I'd like the Game of Thrones books and a lovely bookmark. I'd love to get The Chemist by Stephenie Meyer for Christmas. 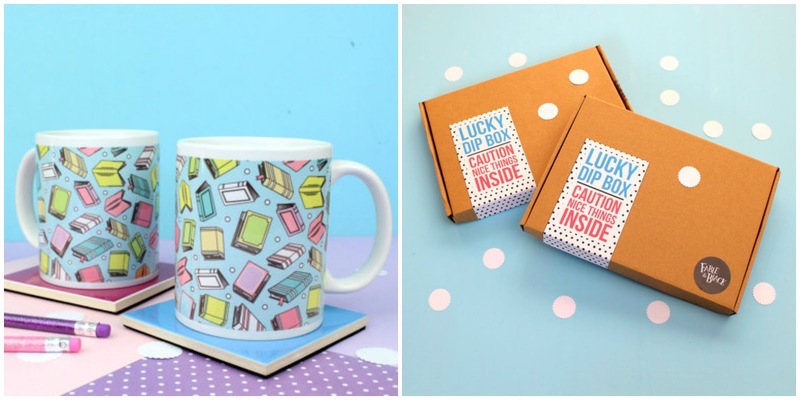 That mug with the books on is sooo cute, too! I am interested in some biographies this Christmas! For Christmas I am not super specific, I love books and any book I get it would be delightful. But for Christmas I am often in the move for fantasy and romance. I would also like to have a pretty new colourful planner for 2017. I hope to get some amazon vouchers so I can grab some new books. I love reading. A few of my wishlist books are the Air Awakens series and The Assassin's Blade by Sarah J. Maas. I'm grateful for any books but the latest Bridget Jones is on my list. I am missing some books from the Divergent series. I would also like the new harry potter book. I would love to have a Kindle Fire!!! I have the latest 4 Dark books by Christine Feehan and the latest Mercy book by Patricia Briggs on my list this year. I am looking for a new genre to read. I am asking for some horror books this year. I've been trying to win The Taking by Kimberly Derting because it sounds sooo amazing! Thank you for the awesome giveaway! I'm hoping for a case for my Kindle and a gift card this year. The newest CJ Sansom mystery! It sounds grinchy but I like to get gift cards to buy books most. I also love so many bookish items on Etsy. You've given me some great "bookish treasure" ideas from there. On a side note, I could find Anniek on FB. I would like to follow her too. Happy Thanksgiving! I need books to complete my series. So some Sarah J Maas and JD Robb would be nice! I can never decide which books from my wishlist I want the most *haha* so my Christmas wishlist is going mor in the direction of bookish goodies like eg a literary scarf from Storiarts or a bookish tea mug. I'm going to get a bunch of books for my son. I would love to get books, gift cards or jewelry. Fantasy and science fiction books are on my wishlist! I always have romance novels - historical and contemporary on my wishlist! I want some Amazon GC so I can get some of the books that I've been needing to complete or catch up on my book collections. I told both my girls, so hopefully I'll get some! The Christmasaurus by Tom Fletcher and the screenplay of Fantastic Beasts and Where to Find Them! Amazon gift cards are always on my wish list. I love visa or paypal gift cards to have a wider broad of choices! I have the Mistborn series on my Christmas list. I've never read them, but I keep hearing great things about them. Kate Carlisle's Deck the Hallways. Thanks for the chance. I am loving Rachel Abbott books so Kill Me Again is next on my list! 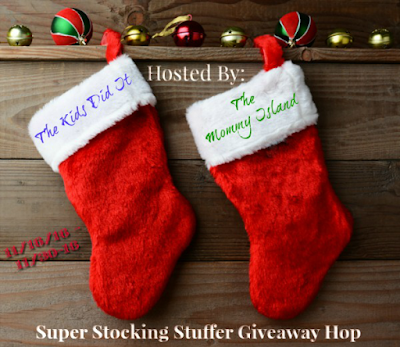 I am only entering your Super Stocking Stuffer Giveaway. and a book mug made by Fable & Black. What kind of books or bookish gifts are on your Christmas wish list? I'd love anything Anne of Green Gables related. A new kindle is definitely on my list! I'd love a sturdy bookmark - at the moment I'm using a train ticket - not very bookish! I have a few books on my wishlist and some audio books. I like books about luck and thrillers. books, bookmarks, booky bags and everything else bookish! The kinds of books on my wishlist are for my kids, they love any book by Robert Munsch! Some contemporary romance books, Throne of Glass series by Sarah J. Maas and bookmarks, a lot of bookmarks. I love receiving books as gifts and especially like a good psychological thriller! I have put In Order to Live: A North Korean Girl's Journey to Freedom on my Christmas list. Santa is on it! I have a huge list of books ready for when my kids ask me what I want. The books on my list are Crooked Kingdom, Gemina, The Suicide Motor Club, and Nevernight. Ones on organization, frugality, minimalism, homesteading. I need a whole bookcase. I have acquired so many books that I cannot part with, that I need another new bookcase for the holidays this year. Anything Harry Potter for me! !